Figuring out exactly why a PC isn't working can be a complicated process, even for experts - there's just so much that can go wrong. Our latest collection of Tiny Tools can help, though, by providing easy access to hundreds of lightweight, (mostly) portable and free utilities. Whether you're suffering unexpected crashes or internet issues, Windows update or performance problems, there's something here to help you restore your system to normal working order. And they're not just for geeks. Many of these tools are so simple that just about anyone can use them to troubleshooting their system problems. When your computer starts misbehaving then it's usually a good idea to check how it's set up. You could head off to Control Panel, but it's quicker and easier to launch WinAudit, which shows you far more information in a single interface: hardware details, Windows configuration, installed applications, Windows services, startup programs, network settings, it's all here. This really is an amazing system information tool for its size, then. And even if you don't understand all of it, you can save the report. Email this to a helpful friend and they may spot your problems. Another good first step when troubleshooting PCs is to make sure you're running the latest versions of your installed applications. Doing this manually can be very tedious, of course - but Patch My PC makes the process very straightforward. Just download the program's single small executable, run it, and in a second or two you'll be notified about any missing updates for a host of common applications and utilities: Adobe Reader, Flash, Java, Firefox, Chrome, Opera, QuickTime, iTunes, 7-Zip, LibreOffice, OpenOffice.org and more, 56 in total. Manually fixing network and internet-related issues can be extremely complicated, but fortunately Complete Internet Repair is here to simplify operations. And it really couldn't be much simpler. Step one: check the box relating to the problem you're having. So if IE is having problems, say, select "Repair Internet Explorer". Or if Windows Updates no longer work, click "Repair Windows / Automatic Updates". Step two: click "Go", and the program handles everything else - there is no step three. Be careful, though, don't apply a fix unless you have the problem specified (and, ideally, a system backup to hand), or you might make things worse. System Restore is one of the most important Windows troubleshooting tools, so it's unfortunate the operating system does such a great job of hiding its various controls and settings. Still, it doesn't really matter, as the compact and portable System Restore Manager makes them all accessible from one location. You can view your recent restore points, for instance; delete any you don't need; create a new restore point, or choose one to restore your system. And whether you want to choose the amount of drive space allocated to system restore, or decide how frequently restore points will be created, the program makes it just as easy. If you're seeing crashes or other PC instabilities when you run graphics-intensive software (playing a fast 3D game, say), then it's possible that your graphics card is overheating. Regular uninstall programs are generally useless, leaving behind a host of junk files and Registry keys to clutter your system and slow your PC down. GeekUninstaller can help, though, scanning your PC for leftovers and making sure it's cleaned up properly. It can remove programs even if the regular uninstall tool doesn't work. And best of all it requires no installation itself: just run the program and it's ready to go immediately. Every troubleshooting toolkit needs a decent Undelete program, and Recuva is a very good indeed. Choose the type of files you'd like to recover (pictures, music, documents, more), and it'll scan the relevant drive (or your entire system) in a flash. A Preview window makes it easy to find your lost files, and you can restore them in a couple of clicks. The only problem: Recuva isn't quite as tiny as we'd like for this particular set of tools. That's because it includes both the 64 and 32-bit edition, though, and deleting Recuva64.exe takes this portable installation down to just a little over 2MB. When you're trying to troubleshoot a PC problem then it often helps to be able to browse the files on its drive. The PC is on the other side of the world? That's where Snap2HTML comes in. 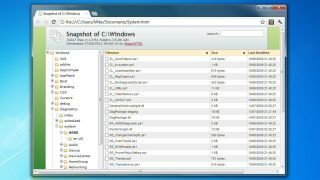 Point the program at a drive and it'll create an in-depth HTML report recording every file. And this isn't just a static list, it's a dynamic HTML file which you can browse just like Explorer, making it incredibly easy to find the information you need. If you're struggling with a complex PC problem and not getting anywhere, Complete windows Repair may be worth a try. This one program can fix issues with the IE, the Windows firewall, your Registry, network, DVD drives, Windows services, sidebar/ gadgets, Windows Update, the Windows Installer and more, all virtually automatically while you sit back and watch. Please note, though, this is strong medicine, and can sometimes cause more problems than it solves. Make sure you create a system restore point before running any fixes, as the program recommends. And ideally you should have a full system backup available, too. Nirsoft and Sysinternals produce the best tiny troubleshooting tools to be found anywhere. But with more than 250 in total, finding those you need, downloading and managing them can be a problem - unless you install Windows System Control Centre (WSCC). This fabulous program has a central console which organises both suites of tools into sensible categories: "File and Disk", "Network", "Video/ Audio", "Web Browser" and more. Helpful descriptions ensure that, whatever your PC problem, you'll quickly find a program to help. And in a couple of clicks you can download and install everything, ready for running on any USB flash drive: the perfect portable troubleshooting toolkit.